ProDen PlaqueOff® is a completely natural product made from seaweed for your pet's dental health. 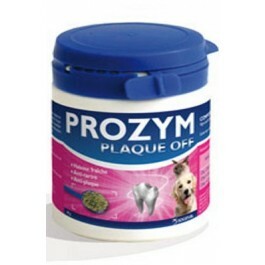 ProDen PlaqueOff® Powder is a pet dental product made from seaweed. Used daily, PlaqueOff® can significantly complement your pet's oral hygiene. 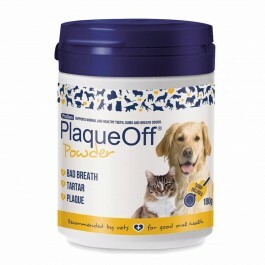 ProDen PlaqueOff®Powder provides an easy complement to your pet’s regular oral hygiene care. The active ingredient is a specially selected alga,Ascophyllum nodosum, harvested along the North Atlantic coast. The 100% all natural product, ProDen PlaqueOff®Powder is free from additives and artificial preservatives and contains no gluten or added sugar. ProDen PlaqueOff® Powdershould be used once daily and can be added to wet and dry food. It can be used by all cats and dogs, and we recommend starting when the animal has got its permanent teeth. The dosage depends on the weight of the animal. Start with a smaller dose to get your pet accustomed to the taste, then increase to the recommended dosage. Sprinkle the product on top of the food or mix it with the dry or wet food once a day. How long it takes before you notice an effect on tartar and bad breath may vary for each individual. If the desired effect is not achieved after 2 months you can increase the dose. Aim to return to the recommended dose when the effect has been attained. The positive effect can be seen as long as the product is taken, but disappears when you stop using it. The product is safe and can be used continuously. ProDen PlaqueOff® Powderis not a substitute for tooth brushing. It is a complement to brushing and the combination will help remove plaque and tartar and keep your pet’s mouth clean. Animals having problems with the thyroid gland must be careful with their intake of iodine. Since algae, including Ascophyllum nodosum, have a naturally high iodine content, we do not recommend that animals with thyroid problems use this product without a prior consultation with a veterinarian. No studies have been carried out with specific focus on the effects of ProDen PlaqueOff® on pregnant or lactating animals. Therefore, we do not recommend giving the product to pets that are pregnant or lactating. PlaqueOff® Dental Bites are a pet dental product made from seaweed. Used daily, PlaqueOff can benefit your pet's oral hygiene. Suitable for cats and dogs.